You may not notice John Mowder at the Washington County Fair. He likes working behind the scenes, then letting his work grab your attention. 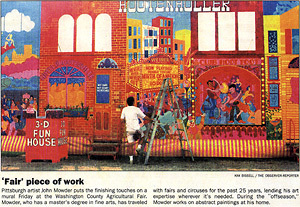 While teen-agers navigated between the games, the carnival barker and the cotton candy and hot sausage booths Monday afternoon, Mowder pulled out his palette, poured on some red and white paint and outlined a rowdy barroom scene. He worked quietly on a huge canvas that was draped across the back of the fun house. "I love the public," he said, then corrected himself. "I love looking at the public, but I don't care to interact with it that much. I don't have the energy for it anymore, either." Mowder, 48, of Pittsburgh, has been working at fairs and circuses almost every summer for the past 25 years, ever since he earned a master of fine arts degree from West Virginia University. Early on, he taught art for six years, but now works at his own studio in Pittsburgh. "There are all kinds of people in this business," Mowder said of the amusement business. "all kinds." Over the years, Mowder has done almost every job at fairs and circuses. He has operated the games, and one season he worked as a circus ringmaster. He looks a lot like the other carnies. Only his worn jeans, stained with paint, and his paint-spattered work boots give away the fact that he's an artist. Mowder said it was the visual appeal of the circus that first attracted him to it. "I was a kid, and the circus was the most colorful thing I ever saw. I just kept after it," he said. "As an artist, nothing could get more interesting - the shapes, the colors, the forms the lines that are happening here. And it changes constantly, every week, or in a circus every day. I can't find anything more stimulating." However, Mowder said his studio work is much different from what he produces on the road. All of his studio paintings are abstracts, but at the fair he paints everything from menus to backdrops. For the next three months, he'll travel with Shaw & Sons to the Hookstown fair, then on to Woodstock, Va., Baltimore, Md., and Kingswood, W.va. After that he'll join a circus, painting and clowning in Georgia and North and South Carolina until Thanksgiving. "Then I'll sit in the studio and paint until early spring," he said, "and then find something else to do out here."